Recently featured in North American Inns Magazine, The Edward Harris House is nestled in an urban village setting. In the heart of the Historic Park/East Avenue Arts/Cultural District of Rochester, the Inn has become known as one of the areas premier accommodations for the corporate traveler. With its six fireplaces, large plush guestrooms and all the amenities of the finest hotels – complimentary newspaper, liberal cancellation policy, flexible check-in and breakfast times, we cater not only to the pleasure traveler, but are a unique sanctuary for the business guests as well. . This circa 1896 mansion has been completely renovated with the your comfort and business needs in mind. Relax and enjoy working on presentations with a cup of coffee in front of a crackling fire. Host a relaxed breakfast meeting with your clients in the quiet elegance of the Inn, porch, patio or cottage gardens. Relax after a long day with a book or jog along the tree-lined streets and nearby parks. Ask about our health club day pass and corporate guest rates Sunday through Thursday evenings. As a minority owned business, Susan Alvarez (having traveled in outside sales for many years) truly understands the issues of our women business travelers. Safe and secure, our guests enjoy the quiet comfort of the Inn and surrounding Park Avenue neighborhood, along with the 21st century details for a productive business trip (wireless internet service throughout the Inn, fax and color copy services available onsite). Just one short block to some of Rochester’s finest restaurants, sidewalk cafes, coffee houses, bakeries, specialty shops, boutiques, galleries and services make our location perfect. Dine al fresco in the appealing village of Park Avenue. 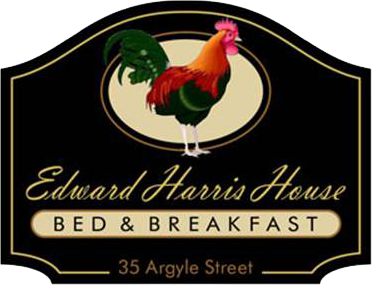 With its proximity to downtown, The Edward Harris House is by far the most convenient and central location in the city. Located just 10 minutes from The Rochester International Airport and Paychex, and 5 minutes from Xerox, Bausch & Lomb, and The Harris Corporation. Airport pick up and delivery can be arranged for you - please contact the staff. Conveniently located just off I-490, pleasure travelers, parents of area college students, relocating professionals and their spouses as well as long-term assignments will find our accommodations suit their needs perfectly. Relax ? let us cater to your needs!